Ottawa Caspian Midsleeper Bed with Workstation. High Gloss Blue or Pink. The Midsleeper bed is a superb addition to the Ottawa Caspian Two Tone Range. The stylish workstation bed features drawers, bookcase, desk and cupboard and is finished in either Blue or Pink. The bed also features a pull out workstation which provides great place for the kids to sit and study. The midsleeper bed compliments our Ottawa 2-Tones range of children's bedroom furniture which offers fantastic style and great value for money! 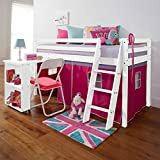 The midsleeper bed is perfect for kids bedrooms with limited space with it's superb storage space. Brighten up the kids bedroom without opening a can of paint or spending a fortune! The range features High Gloss Doors and Drawer fronts with the Frames finished in a lighter shade Matt to compliment the Gloss. All units are fitted with metal drawer runners and metal, colour co-ordinated handles with gel inserts. 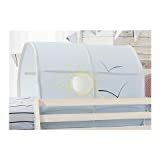 This range is very popular as it will transform a child's bedroom for very little money. 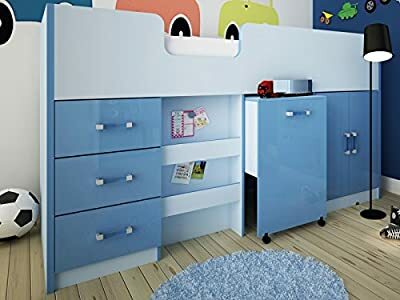 Functional kids bedroom furniture with a reassuringly affordable pricetag! Fixings & fittings are all supplied. Midsleeper Workstation Bed features Drawers, Bookcase, Desk and Cupboard. An amazing kids bed with mega storage capacity to keep the bedroom tidy! Choice of Pink or Blue for Boys or Girls Bedrooms. DIMENSIONS: Length:194cm Width:95.2cm Height:110cm - Standard 3ft Single Mattress Required Mainland UK Delivery Only. Sorry but we do not deliver to Scottish Highlands & Islands, ALL offshore Islands & Ireland.